SUMMARY: Illegal addictive drugs can lead to functional or structural impairment of the central nervous system. This review provides an overview of the structural imaging findings on CT, MR imaging, and conventional angiography related to chronic and acute abuse of the most commonly abused illegal drugs, including cannabis, organic solvents, and amphetamines and opioids and their respective derivatives. Pathomechanisms include excitotoxicity, which may lead to an acute or subacute leukoencephalopathy, and vascular complications, including vasoconstriction, vasculitis, or hypertension, which may lead to intracranial hemorrhage or ischemia. Because clinical findings alone are often nonspecific, and afflicted patients are unlikely to admit to the substance abuse, the neuroradiologist may play an important role in establishing the diagnosis and, thereby, initiating treatment. Illegal addictive drugs can alter both the function and the structure of the central nervous system.1–3 Functional imaging studies, such as MR spectroscopy, functional MR imaging, single-photon emission tomography, or PET may detect changes in the regional cerebral blood flow, cerebral activity, and neuropharmacologic parameters, such as receptor number and neurotransmitter levels.4,5 These methods are, therefore, of importance in detecting the functional or metabolic impairment following illegal drug abuse. On the other hand, conventional imaging methods (ie, CT, MR imaging, or angiography) will demonstrate the structural damage done to the brain. These structural alterations may be due to acute or chronic toxicity, they may be reversible or irreversible, and their pattern of involvement may be specific or nonspecific for the substance used. Because clinical symptoms are often nonspecific and may mimic other etiologies and because the correct diagnosis is of great importance to prevent further damage to the brain, the neuroradiologist plays a crucial role in raising the suspicion of illegal drug abuse. This review describes the most commonly encountered addictive drug−induced changes to the brain, their pathomechanisms, clinical findings, and, most important, their imaging features, focusing on structural rather than functional imaging studies. Cannabis or marijuana is the most commonly used illicit drug worldwide.6,7 The major psychoactive compound is δ-9-tetrahydrocannabinol, which is a lipid-soluble substance that causes activation of the CB receptors. The CB receptors are heterogeneously distributed in the brain, with the highest densities in the basal ganglia, substantia nigra, globus pallidus, dentate gyrus of hippocampus, limbic cortices, and cerebellum.8 Smoking is the preferred route of drug delivery, but it can also be taken orally. Acute effects of cannabis include cognitive dysfunction, memory and time-assessment alterations, motor incoordination, poor executive functions, and sedative effects.9 Cardiovascular changes occur for about 2–3 hours following drug abuse, with an increased heart rate and cardiac output, increased blood pressure in the supine position, and orthostatic hypotension. Chronic use can lead to behavioral changes and seems to increase the risk for developing schizophrenia. Ischemic strokes related to cannabis have been reported in the literature; however, due to the widespread use of the drug and confounding problems of polydrug abuse, it is difficult and often impossible to establish whether these strokes are truly associated with cannabis or other ingested drugs or are purely coincidental. Vasospasm, orthostatic hypotension, and vasculitis have been proposed as mechanisms in young patients without other vascular risk factors.10 Functional imaging studies, including PET and MR perfusion, in the acute stage of cannabis abuse demonstrate an overall decrease in regional cerebral blood flow in the frontal, parietal, temporal, and occipital lobes,11,12 while transcranial Doppler shows an increased pulsatility index due to increased resistance from vasoconstriction.13 The stroke pattern reported following cannabis ingestion is nonspecific, and imaging findings are indistinguishable from those in strokes of other causes. Toluene or methyl-benzene is a lipid-soluble aromatic hydrocarbon, which is commonly used as a solvent in many industrial products such as paint, paint thinner, glue, or ink. It is widely abused in many countries14,15 due to its widespread availability and low cost. There are hardly any discernible withdrawal symptoms. Long-term occupational exposures, for example, in dry cleaning, aviation, and chemical industries, may lead to chronic intoxication. The lungs rapidly absorb the inhaled toluene into the blood, and the substance subsequently accumulates in the lipid-rich brain.16 Toluene is oxidized into benzolic acid before being conjugated with glycine in the liver to form hippuric acid, which is excreted by the kidneys. Acute intoxication following inhalation is clinically characterized by reversible behavioral changes, euphoria, headache, and ataxia (afflicted subjects are referred to as “spray heads”). In the acute stage, no alterations are seen on structural imaging; in chronic abusers, however, irreversible neurologic damage with structural alterations will occur.17,18 Findings of toluene-induced chronic toxic encephalopathy include changes in cerebellar and cerebral white matter, with demyelination and gliosis, which leads to cerebellar dysfunction; psychiatric disorders; spasticity; cognitive changes; and secondary Parkinson disease. Symptoms of attention deficit; decline in visual-spatial skills, frontal lobe function, and memory retrieval; hearing and visual loss; and cranial nerve abnormalities may also occur. Long-term exposure will result in brain atrophy, predominantly in the cerebellum, owing to a decline of Purkinje cells in the brain stem at the pontine level and in the hippocampus. There are few reports of optic nerve atrophy. 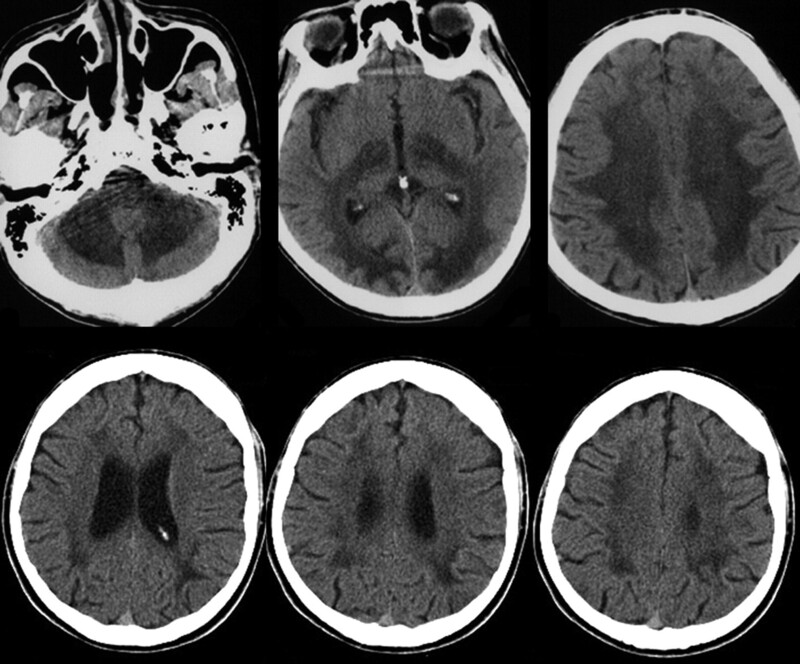 A 19-year-old woman presented with acute onset of headaches to the emergency department. CT demonstrates an intraventricular hemorrhage with a potential parenchymal component close to the right ventricular wall (arrows on CT). Drug screening was positive for alcohol and cocaine. 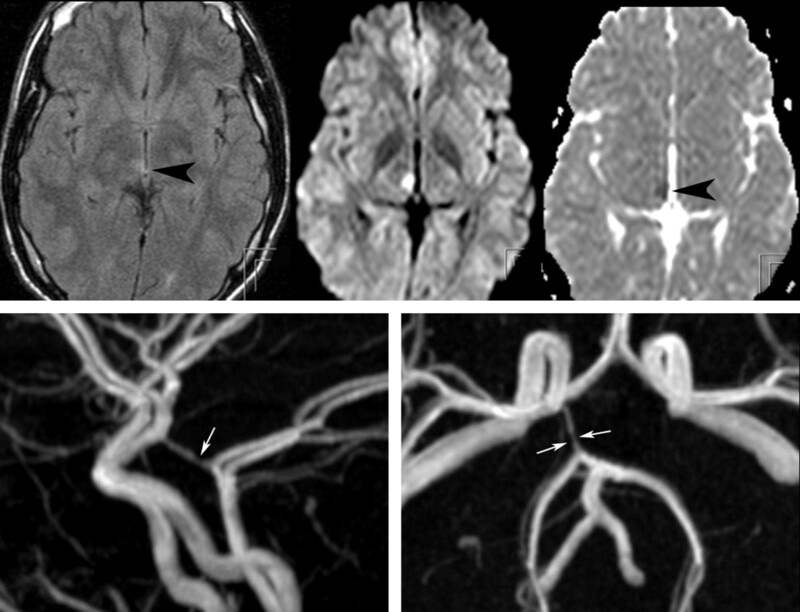 Because approximately half of the patients with intracranial hemorrhage following cocaine abuse have an underlying cause for their hemorrhage, angiography was performed, demonstrating a choroidal arteriovenous malformation fed by the posterior lateral choroidal artery (arrows on angiography) of the posterior cerebral artery, with slightly early venous filling (arrowheads), which was subsequently successfully embolized. A 23-year-old woman woke up with a complete hemiplegia. Following a positive urine analysis, she admitted having taken considerable amounts of cocaine the night before. MR imaging demonstrates an MCA branch ischemia including involvement of the basal ganglia. T1-weighted postcontrast scans demonstrate abnormal vessel wall enhancement in the right MCA (arrowheads), and the time-of-flight MRA shows some mild irregularities of the distal M1, potentially testifying to acute drug-induced vasculitis as the most likely cause for the ischemia (arrows). Ecstasy or MDMA is a drug derived from methamphetamine, which is popular as a party drug because it has both stimulating and mild hallucinatory effects. In the acute phase, the drug users experience euphoria, increased self-confidence, increased sensory perceptions, tachycardia, and hyperthermia.31,32 Trismus or acute psychoses may be present. The effect wears off after 24–48 hours, with patients experiencing muscle aches, depression, fatigue, and decreased concentration. This young male patient with a subacute onset of hemisensory deficit following ingestion of an unidentified psychoactive designer drug has a small area of cytotoxic edema with fluid-attenuated inversion recovery hyperintensity and decreased apparent diffusion coefficient value in his right mediodorsal thalamus, which is classically supplied by thalamoperforators arising from the distal posterior communicating artery (arrowheads). The time-of-flight MRA at 3T demonstrates a focal narrowing of this artery at the presumed origin of the thalamoperforators supplying the infarcted region (arrows). Drug-induced vasospasm or local vasculitis is presumed to be the cause for his acute ischemia. Heroin is the most commonly abused drug within this group and has the most significant adverse effect on the brain.39 Other derivatives include morphine, hydrocodone, oxycodone, hydromorphine, codeine, and other narcotics such as fentanyl, meperidene, methadone, and opium. Three types of receptors are activated by heroin: Stimulation of the μ opioid receptor will result in analgesic effects, euphoria, respiratory depression, and miosis, while stimulation of the κ and δ opioid receptors causes analgesic, dysphoric, and psychomimetic effects.40 Both acute and chronic effects of heroin on the brain have been described and include neurovascular disorders, leukoencephalopathy, and atrophy.39,41 In addition to these primary or direct effects of heroin on the brain, secondary complications have to be differentiated. These are related to added impurities (either lipophilic additives [“cutting”] or crystalline impurities), and they may also be secondary to associated diseases (such as infections or epilepsy). 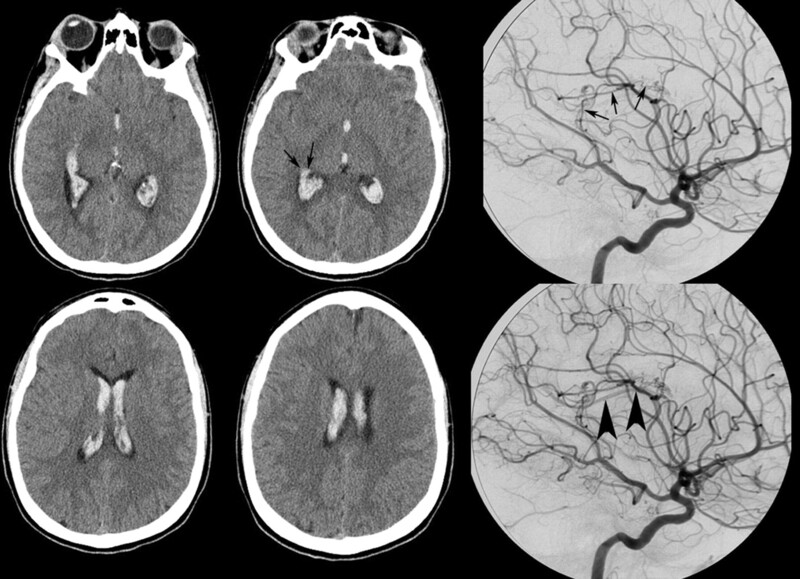 Ischemia is the most commonly encountered acute neurovascular complication caused by heroin. The proposed pathomechanisms are manifold (similar to ischemia related to cocaine) and include the following: 1) direct effects of the heroin with reversible vasospasm from stimulation of the vascular smooth muscles by the μ opioid receptors, 2) vasculitis from immune-mediated responses (which may be related to the heroin itself or to impure additives), or 3) embolic events from crystalline impure additives (Fig 4).42,43 Ischemia is more often encountered following intravenous injection compared with other routes such as oral ingestion or inhalation.43 The globus pallidus is the most commonly involved location, and infarcts in this location are present in approximately 5%–10% of chronic heroin abusers.44 In addition to acute ischemia, white matter changes from microvascular disease can be seen in chronic heroin abusers. Diffuse, symmetric, and bilateral T2 hyperintensities may be perceived in the subcortical or periventricular white matter, compatible with vascular leukoencephalopathy. However, these changes are commonly not as severe as in chronic cocaine abusers. 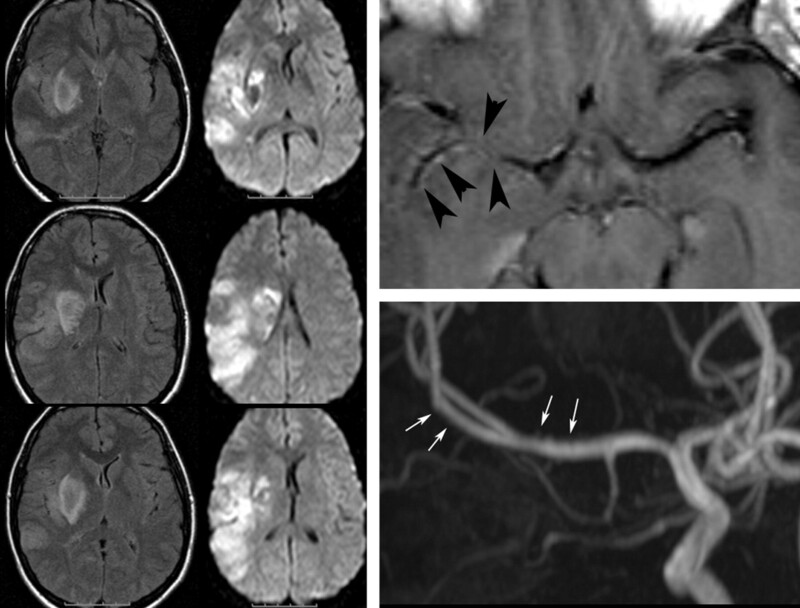 Acute areas of ischemia in both the anterior and middle cerebral artery territories involving predominantly the gray matter as a result of a diffuse vasculitis with a “pearl-and-string” sign along the anterior cerebral artery, with an acute occlusion of the pericallosal artery (arrows) and luminal irregularities in multiple different vessels in a patient with intravenous heroine abuse. Whether the described vasculitic pattern is due to vasospasm (ie, the primary effect of the opioid), immune-mediated responses against the heroin or added impurities, or a primary infectious process of the vessel wall cannot be differentiated. Acute (upper row) and chronic (after 6 months) effects following heroin inhalation (chasing the dragon). In the acute phase, a diffuse edematous swelling of the white matter is present both supra- and infratentorially. On follow-up after 6 months, the patient demonstrated mental retardation and persistent psychosis. CT demonstrates bilateral degeneration of the white matter with concomitant widening of the ventricles. Chronic effects of heroin inhalation (typical form). Diffuse white matter changes are present, with sparing of the dentate nuclei and the cerebellar cortex and involvement of the corticospinal tracts and medial lemnisci. Clinically, this patient presented with a progressive spastic paraparesis. Chronic effects of heroin inhalation (atypical form). This patient presented with psychosis and progressive dementia 20 years after she discontinued heroin inhalation (which she performed for nearly 10 years). Although not proved, the vacuolic degeneration speaks in favor of heroin-induced leukoencephalopathy, which is predominant in the white matter of both temporal lobes. From a clinical point of view, the subacute heroin-induced leukoencephalopathy progresses from cerebellar symptoms to extrapyramidal symptoms, spasms, and hypotonic tetraparesis, eventually leading to the patient's death. The findings on MR imaging consist of T2 hyperintense lesions, predominantly in the white matter of the cerebellar hemispheres and posterior limb of the internal capsule (with sparing of the anterior limb), and the subcortical white matter, predominantly in the posterior aspect, only extending to the anterior aspect in severe cases or late stages. While in acute stages, diffusion restriction is present, testifying to cytotoxic edema, the subacute stages will demonstrate an increased diffusion due to myelin breakdown. Infections are the most important secondary complication of heroin abuse. CNS infections may occur following endocarditis due to nonsterile conditions associated with intravenous drug abuse. Up to 45%–58% of drug users with endocarditis will eventually develop neurologic complications, including septic emboli resulting in brain abscesses, and mycotic aneurysms caused by inflammatory destruction of the vessel wall.50,51 The most common responsible organism is Staphylococcus aureus.52 Brain abscesses have the well-known and characteristic thin rim-like contrast enhancement surrounding a core that is hypointense on T1 and hyperintense on T2-weighted scans and that demonstrates diffusion restriction.53,54 Extensive perifocal edema is present. 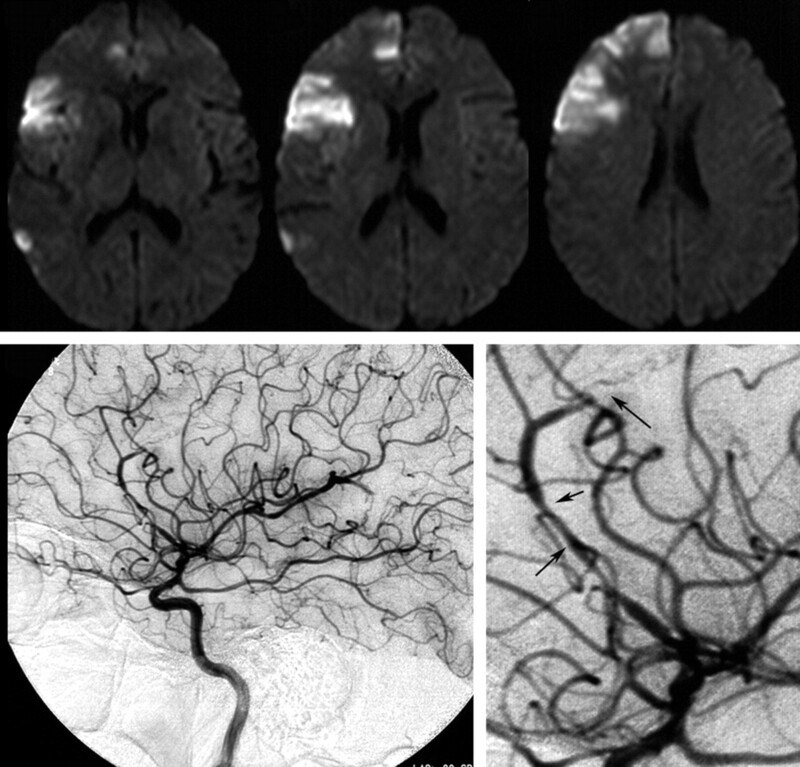 Mycotic aneurysms can occasionally be seen on MRA; however, due to their small size and their peripheral location, they are better detected on conventional cerebral angiography and are seen as multiple small fusiform dilations involving the peripheral cortical arteries or perforators, with proximal and distal irregular narrowing and contrast stagnation in the capillary phase. The main pathomechanisms related to the abuse of addictive drugs are ischemia, hemorrhage, and leukoencephalopathy related to excitotoxicity of the drug or its derivatives. While some imaging patterns are specific for a certain drug, others are overlapping. Clinical findings, especially in the acute setting, are often nonspecific, requiring the neuroradiologist to include drug-induced causes into the differential diagnoses of hemorrhage, ischemia, and diffuse white matter changes, especially in young patients. Cannabis-related Stroke: Myth or Reality?